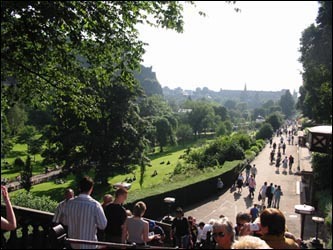 Princes Street was originally planned to have no buildings on its southern side, to afford the residents a view to the castle and the old Town. 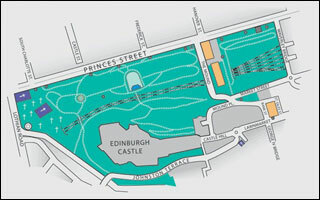 The former site of the Nor' Loch, was initially developed as private garden plots but from 1876 it was designated a public park. The Mound divides the gardens, with the east side covering an area of 8.5 acres to Waverley Bridge, and the west side an area of 29 acres extending to St. John's and St Cuthbert's churches. The location has remained largely unchanged through the years, though in 1846 the railway was extended through the back of the gardens, a development that was not without controversy. Within the gardens, along the south side of Princes Street are numerous statues and monuments. The most dominant of these is the Scott Monument (1846). Other notable figures, commemorated scupturally in the East Gardens include explorer David Livingstone (1813-73), publisher Adam Black (1784-1874) and essayist Professor John Wilson (1785 - 1854). In the West Gardens are statues of poet, Allan Ramsay (1681-1758); reformer, Thomas Guthrie (1803-73); obstetric pioneer, James Young Simpson (1811-70). 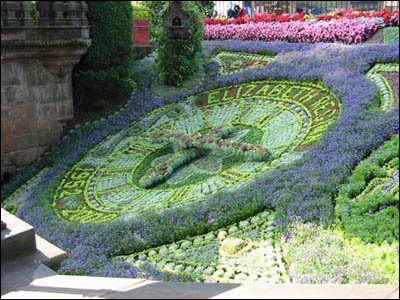 The Ross Fountain is also situated here, as is the famous Floral Clock and the Ross Bandstand which hosts concerts during the Festival and Hogmanay celebrations.